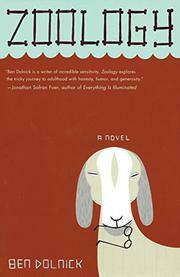 A young man finds unrequited love and loses a goat in Dolnick’s first novel. When he flunks out of college, Henry Elinsky moves into his brother’s Manhattan apartment and takes a job at the Central Park Children’s Zoo. When he’s not tending pigs and sheep, he spends his time trying to get a girl named Margaret to fall in love with him. He also eats Reuben sandwiches and feels fat. Henry is self-absorbed, rather cowardly and not very bright, and his story heaves fitfully from merely tedious to actively unpleasant. Dolnick makes little use of the zoo and its denizens. It never seems that Henry works at the zoo because his creator made a conscious, artistic choice to put him there. It seems, instead, that Henry works at the zoo because that is where he happens to work, and one suspects that he happens to work there because Dolnick happened to once work at a zoo. To call this a coming-of-age novel is misleading, as the protagonist does not mature in any meaningful way. At the end of the story, he’s preparing to go off to college, which means he’s back where he was before the story began, and the narrative gives us no reason to think that Henry has grown emotionally or intellectually from his summer of shoveling animal excrement, pining for an unavailable girl and reading The Hunt for Red October. What the narrative provides instead is the image of Henry turning this unsatisfactory summer into an equally unsatisfactory record of that summer. Henry’s account of his months in New York doesn’t include much in the way of reflection or analysis, but it does include a depiction of the creation of that account. Perhaps it’s inevitable, in this memoir-laden age, that writing about one’s experience becomes not a method for processing it—understanding it, learning from it, transforming it—but, rather, a substitution for any such process.